THE financial charges against self-styled Prophet Shepherd Bushiri including money-laundering, fraud and contravening the Prevention of Organised Crime Act in South Africa is casting shadows over Namibia with an ongoing investigation into his controversial and embarrassing visit to Namibia in 2016. Yesterday, Shepherd Bushiri and his wife were granted bail of R100,000 each. Bushiri and his wife, Mary, denied that they were responsible for the charges against them and argued that they have had no previous convictions against them or pending warrants of arrest. Bushiri hired top legal mind advocate Barry Roux to defend him and his wife against the fraud and money laundering charges. Roux represented murderer Oscar Pistorius during his much-publicised trial in 2014 for killing his girlfriend Reeva Steenkamp. He is estimated to be charging up to R50,000 a day. Dozens of supporters flooded the area around the court pledging their support for “Major 1”, as Bushiri is popularly known amongst his congregants. They demanded that the couple be released. The couple’s fraud charges, according to City Press newspaper, emanated from Bushiri’s purchase of a private jet in 2015 where he paid $1,147,200 (R15.3m) in cash – in contravention of exchange regulations. 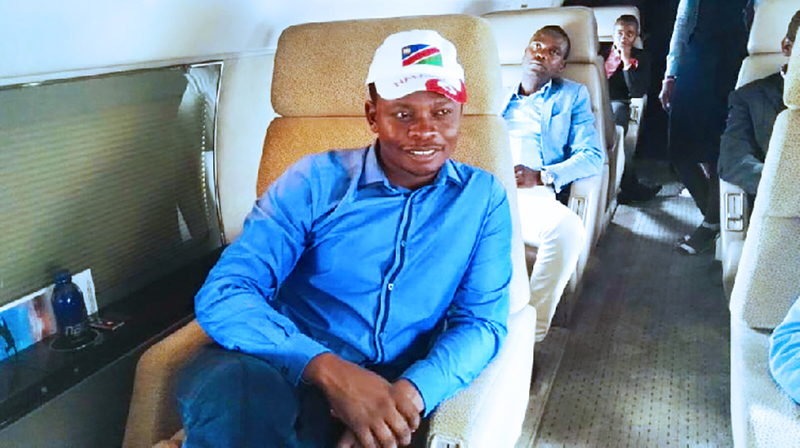 In 2016, Bushiri arrived in a luxury private jet where a picture of him was taken with a Namibian branded cap. He was escorted by a motorcade and a reception fits for heads of state for a gala dinner at Ramatex and a crusade. A jam packed Sam Nujoma Stadium drew an estimated crowd of 20 000, while the Ramatex gala dinner treated 3 000 guests who turned up after paying N$1 000 each for the dinner. Special guests, amongst them MD of Namcor, Imms Mulunga, reportedly paid N$125 000 just sit close to the prophet. One of the organisers was the spokesperson for the ministry of Home Affairs, Salome Kambala, who came under fire as questions were raised about taxes and a work permit for Bushiri. Both the then minister of Home Affairs, Penduikeni Ithana, and the Minister of Finance, Calle Schlettwein, announced investigations into possible contravention of the state finances acts as well as visa contraventions. The Bushiri-Mulunga relationship was revealed by an angry wife and now ex-wife, Sonia Mulunga, who alleged that the couple visited Bushiri for divine intervention to restore their marriage which collapsed a few days later. The scorned wife also claimed that she was tricked by her husband to join the Bushiri church. The leader of the Association of Charismatic and Pentecostal Churches of Namibia, Pastor Fritz Gaweseb, was at the time quoted saying people should stop running after prophets for miracles. Home affairs permanent secretary Patrick Nandago after the Bushiri visit revealed that Bushiri came on a work permit, which according to the minister of Finance qualified Bushiri for paying tax on his income from the Ramatex gala dinner. Police Inspector General Sebastian Ndeitunga, who was at the time facing severe criticism for giving Bushiri State protection, said the Khomas regional commander told him about a letter from the committee that organised the Bushiri gathering requesting police deployment for security reasons because of the magnitude of the people expected to attend. “It was just to maintain law and order in case anything happened and the police would act,” he said at the time. 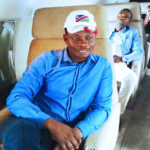 Kambala claimed that Bushiri did not pocket a single cent from the gala diner where promotional materials such as hats and T-shirts, holy water and anointed oil were sold. She said Bushiri is only a “seasonal prophet” and that he came to preach the Gospel without expecting anything in return. Schlettwein is currently in Addis Abbaba for official duties and will respond to the 2016 investigation upon his return, a spokesperson said.